It seems like such a long time since I covered the first issue of this series, and here I’m only at the second! The cover’s a bit generic–I truly don’t think I’ve really paid it much attention over the years. I’d had the issue originally solely for the RUNE coupon, and just recognize the overall image with the trade dress as the second issue of Firearm. Looking at it more closely this time and actually "taking it in," it’s Firearm fighting a couple of armored suits, aiming one’s weapon to blast another upward where the title falls. It’s also interesting to me the "design" stuff I’m seeing, that have always been there, but with a class I’ve been taking, there’s a lot that I’m really "seeing" for the first time or at least in a new light! And I’ve always liked and easily recognized the way the Ultraverse titles’ trade dress started with the inner border, the ULTRAVERSE logo across the top with the actual title logo under, and the upper left corner logo and issue info/price. Getting into the issue itself, we find Alec Swan waking up, feeling the results of the previous issue/recent events. He follows up on some information, and is led to Hardcase…who he finds in the midst of a fight with some thugs in high-end power/exo-armor suits. He gets involved ostensibly only because Hardcase may have information he needs. Among other things, part of Swan’s contribution is grabbing one and aiming its blaster at another…different angle, but showing that the cover actually depicts something from within the issue itself! (A true rarity as of 2018). After the fight, he and Hardcase talk–and neither likes the other, but at least they don’t–themselves–fight. While Hardcase doesn’t consciously have any recollection of the guy Swan’s trying to find information on, he does say something that gives him a lead. As he parts ways from Hardcase to follow up, he’s attacked by another ultra…and saved by still another…which is something he’s getting really tired of. The story itself is good, and follows well on the first issue. This also reads relatively decently on its own–it’s been weeks since I read #1 and I didn’t remember much concrete detail from it, but didn’t have much problem getting into this issue. We see Swan continuing to work the case he took on in the first issue, and the continuing repercussions from stuff begun in the first issue. We see a bit more of him at work, and in action, solidifying the "codename" Firearm, as well as the fact that he hates that name. Though it’s in no way advertised as such and there’s no cover indication, we see him interact with Hardcase. It’s not an "event" or "crossover," it’s just a natural thing of Swan living in a world of ultras, which includes Hardcase. Though we still don’t have resolution, we can surmise that Swan’s getting closer to his goal, with continued attacks, and now being saved by an ultra…hints that something bigger is going on that he hadn’t bargained for, but now finds himself immersed in. I think my main problem with the story/writing is that though Hardcase mostly looked like Hardcase and is supposed to BE Hardcase…his appearance here made him feel like just some impersonal plot device, with a different sort of "voice" and lacking the sort of "heart" from his own title or the crossover with his title and the Strangers in the September issues. Visually, this wasn’t a bad issue on the Firearm end…but I really strongly noticed some weirdness in the visual interpretation of Hardcase. The face especially just looked weird, with odd lines around the mouth and generally carrying the basic core visuals, but looking more like "a version of" Hardcase rather than a singular THE Hardcase. Otherwise, the art’s good and no real complaints from me…it fits this title and the main character and carries the story. As Rune gets closer to a goal–a power source his stones have foretold, we find someone investigating another death from the vampiric creature. This investigator apparently is an ultra, able to sense things…though he’s not quite finely-tuned enough in use of his power to realize that his sensing Rune was because the creature was right there. As Rune attacks, the folks on the other end of the agents connection are helpless to do anything. We’ve continued to see a bit more of a development in the Rune story, from just brief glimpses at the creature in different time periods, to seeing him attacking various ultras for power, as well as discovering Aladdin and moving in on this secretive agency. Including this chapter, we’re at 27 pages now–the full Rune #0 is a 33-page thing, making it about the equivalent of a 2018 Marvel Annual with 32-ish pages. 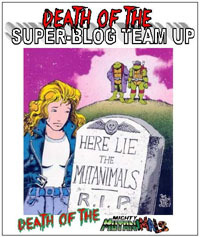 Except here it’s serialized on the backs of each of the 11 October 1993 Ultraverse titles. Something to this chapter has a bit of a different look than earlier chapters seemed to–probably the darker, rain-soaked setting of the chapter. 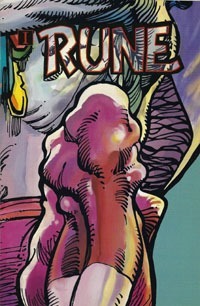 We do have a panel with one of the more horrific glimpses of Rune…clearly an image out of a nightmare. Same creative team as all the other chapters, so despite the darker tone visually, this is still quite consistent with previous chapters! This is not a standalone issue of Firearm…though it works well despite not having a recap page and I didn’t remember much in the way of specifics from the previous issue by the time I read this, with going through around 16 other issues between. The Rune chapter is somewhat on its own, yet builds on earlier chapters. As with the other issues from October 1993, there’s nothing really to make this an issue to single out in isolation. Especially as only a second issue, if you’re going to get this, I highly recommend ALSO getting the first issue, and probably also the third. 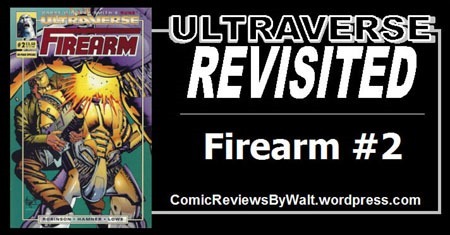 Firearm #2 is a solid Ultraverse issue, moving Alec Swan’s story forward, showing us that he really is in the same universe as the other Ultras thanks to the Hardcase appearance, yet still manages to stick to itself, not really drawing on nor impacting other titles. This is certainly worth 25-50 cents as a purchase in isolation or otherwise, and like other "early" Ultraverse comics, I wouldn’t suggest spending more than $1-$2 on it unless it’s an elusive issue to fill a specific gap. It’s good quality, just not something that should command any significant pricing.